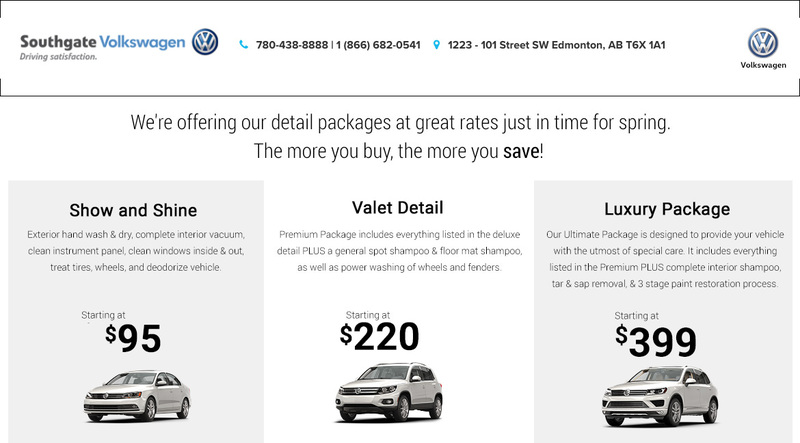 Explore Affordable Detailing Packages from Southgate Volkswagen! Your Volkswagen is a German precision-engineered automobile, and you take great pride in owning it. That’s why you want to keep it clean and free from dirt and debris that can cause rust, paint fade, and other damage to your vehicle. Thankfully Southgate Volkswagen offers a trio of affordable detailing package – everything from a simple wash to a total reconditioning both inside and out. We know you take pride in your Volkswagen’s appearance, and we take pride in helping maintain its appearance! Book Your Appointment today and let our professional detailers ensure your Volkswagen is looking its best! If you drive a vehicle other than a Volkswagen, but still want it to looks its best, then you can take advantage of our detailing packages! Our team of detailers excel at their profession because of a love of automobiles. So no matter what you drive, if you want to return it to showroom condition, then visit Southgate Volkswagen today! Over time, a vehicle’s interior can because increasingly dirty with leftover trash, dirt, mud, snow, grime, and all manner of other debris. Cleaning it can also be difficult, tedious work due to the innumerable small crevices and gaps where dirt can hide. Leave the hard part up to Southgate Volkswagen’s detailing team and let us make your vehicle’s interior look, feel, and even smell like new again! When you bring your car, truck, or SUV into Southgate Volkswagen for detailing you can be assured that your vehicle is in the hands of trained professionals. Our detailing team know which cleaning fluids work best on what surfaces, how to make your vehicle look and feel like new, and how to quickly and efficiently clean even the dirtiest interiors. And with years of experience cleaning every make and model of vehicle – rest assured that yours is in good hands.